Every January in Britain, the rail companies put up some of their fares. And every January in Britain lots of people complain. Which is odd, because most other businesses are constantly changing their prices but we don’t get anything like the same fuss when they happen to put some of those prices up. The reason, for the most part, is government. In Britain the government uses the threat of violence to regulate a certain number of fares, largely those on London’s commuter routes. In January the government allows rail companies to increase their fares in line with inflation plus or minus a small percentage. As well as involving violence regulation has all sorts of negative side effects. The main one is overcrowding (see A generic piece on overcrowding). It also deprives rail companies of the sort of price signals they need to run their businesses successfully. The term “price signals” deserves some explanation. Essentially, it is a rather hoity-toity economic term for when consumers and producers change their behaviour in response to changes in price. As consumers we do it all the time. We do it every time we say “that’s too expensive” or “that’s good value”. As employees we say do it when we say “that job’s offering more money, I think I’ll take it.”. But producers do it too. They say “That’s expensive, we could make a profit out of doing that.” It is the phenomenon that makes markets work. Without it we wouldn’t have the adundance of goods of all kinds we currently enjoy. Because rail companies are deprived of price signals they don’t know how much people are genuinely prepared to pay for a seat, how much they are prepared to pay to stand, and, therefore, don’t know what sort of mix of seating and standing they should be providing. Nor do they know how many trains they should run and whether increasing the number of trains would justify the cost of, for instance, new signalling. OK, so maybe you’re not quite so keen on the theory. But take a look at the practice. What do rail companies do when they are free to set their fares? Before the Second World War there was very little regulation of fares. In the period from 1900 up to then all sorts of improvements to the railways took place. This was mainly in the form of electrification but also other things such as comfort, safety, speed and frequency. That’s not to say that some people didn’t stand, they did, but generally-speaking things were getting better. Few people complained about fares being too high. If you’re unconvinced by that look at other industries. The general rule is where there are price controls there are shortages and where there aren’t, there’s abundance. It is worth pointing out that while allowing rail companies to charge something nearer the market rate is a step in the right direction so long as regulation and the threat of regulation exists, it is difficult for companies to plan for the future. And given the wheel-rail split and the short-term nature of franchises that is even more the case. So, you would allow train companies to charge whatever they like? But wouldn’t they charge the earth? And when they do wouldn’t that mean that lots of people could no longer afford to get to work and end up unemployed? What we have here is a conflict between the short term and the long term. The advantages of market prices will for the most part only be seen in the long-term while the disadvantages (higher prices) will be seen almost immediately. One of the sad things is that we don’t know how severe the short term pain is likely to be. It might indeed lead to the doomsday scenario but equally other things might happen. For instance, in many cases employers may find that they don’t need all their employees to show up on the dot at 9 o’clock in the morning. So, it may be possible for many of them to travel off-peak. Now in Britain we already have low prices after 0930 but not before 0700. This is odd because before nationalisation there were lower fares for early-morning travel known as Workmen’s Fares. If they could do it then we can surely do it now. Equally, many rail companies may take the view that the profit-maximizing price isn’t that much higher than it is at the moment or that a better way to gain goodwill would be to approach it at only a slow pace, say 20% a year or so. But the point is that impoverishing ones customers is unlikely to be good business. The sensible rail company would seek to minimize the pain. What sort of long-term gain do you see? It is difficult to gaze into the future. That’s one of the weaknesses of being in favour of freedom: you can’t predict with any certainty what will happen. For instance, it may be the case that something comes along which replaces railways for good. I could speculate on rail companies running longer trains or double-deck trains or having different classes of carriage: guaranteed seat, standing-room only etc or introducing seats that are locked out of use at peak hours, but I really have no idea what would happen. All I can be sure about is that it is likely to be a lot better than the situation that we have at the moment. I take heart from the fact that in the days of fare freedom when the London and South West Railway was about to introduce the first electrified services they reduced the fares. Why? One can’t be certain but my guess is that electrification meant that they could run more services so they wanted more people to use them. ...first post. Thought I should mention that. Every January in Britain, the rail companies put up some of their fares. And every January in Britain this leads to outrage. Which is odd, because most other businesses are constantly changing their prices but we don’t get anything like the fuss when they happen to put some of those prices up. The reason, of course, is government. In Britain the government regulates a certain number of fares, usually on the busy London commuter routes. Or, to put it another way, in Britain the government uses violence and the threat of violence to regulate fares. It is in January that the government allows rail companies to increase their fares in line with inflation plus or minus a small percentage. Not only is this practice wrong but it also distorts the market leading to overcrowding (see A generic piece on overcrowding). It also deprives rail companies of the sort of price signals they need to run their businesses successfully. Because they don’t know how much people are genuinely prepared to pay for a seat, against how much they are prepared to pay to stand, companies don’t know what sort of mix of seating and standing they should be providing. Nor do they know how many trains they should run and whether increasing the number of trains would justify the cost of, for instance, new signalling. Worse still, while allowing rail companies to charge something nearer the market rate is a step in the right direction so long as regulation and the threat of regulation exists, companies are unable to plan for the future. What we have here is a conflict between the short term and the long term. The advantages of market prices will for the most part only be seen in the long-term while the disadvantages (higher prices) will be seen almost instantly. One of the sad things is that we don’t know how severe the short term pain is likely to be. It might indeed lead to the doomsday scenario but equally other things might happen. For instance, in many cases employers may find that they don’t need all their employees to show up on the dot at 9 o’clock in the morning. So, it may be possible for many of them to travel off-peak. Equally, many rail companies may take the view that the profit-maximizing price isn’t that much higher than it is at the moment or that a better way to gain goodwill would be to approach it at only a slow pace, say 20% a year or so. It is difficult to gaze into the future. That’s one of the weaknesses being in favour of freedom. You can’t predict with any certainty what will happen. For instance, it may be the case that something comes along which replaces railways for good. “Outrage”. We need a better explanation as to why. I think a lot of it is to do with fear: “I’ve got my job, bought my house and if the fares go up too much one of them is going to have to go. Hey, I could even end up destitute.” Hmm, actually that’s the fear of fare freedom. The outrage at a rise is different. We need something on the history of this. Before 1940 there was almost no fare regulation at all. Things seemed to work fine. Certainly, there was nothing like the outrage we get these days. OK, there were some problems immediately after the First World War with delays and overcrowding. I’ve heard the explanation that this was to do with the introduction of an eight-hour day but I would like to get to the bottom of this. “Not only is this practice wrong…” Weak. What I want to get across is that the government is using violence and violence is wrong. I want to point out the inherent niceness of freedom. Price signals. Too technical. I think we need to imagine a situation where price signals would have an impact and avoid using the term entirely. Could do with a piccie as well. Actually, I’m not even sure this is the right article. “A generic piece of fares” might be more appropriate. As President Raul Castro agrees to allow people to buy and sell cars in Cuba, there are concerns the move could spell the beginning of the end for many of the island’s classic American cars. This sent flecks of spittle flying around me, but the text does not actually appear on the BBC site I wonder where it came from. Although Michael Voss sounds a bit sad, he does point out that Cubans will be glad to see the back of these cars. One man inherited a car from his father, but would rather have the money to start a business. Well, that’s kind of the point of free markets right there: you can swap stuff you don’t want for stuff you do. I see we have a new Secretary of State for Transport. You know what? I’ve even met her! Long time ago, mind. When I heard that news I started thinking about what advice I would give (fantasising that I might ever be asked). I started coming up with a long list of sensible things like: ending the wheel/rail split, liberating fares, tearing up the Transatlantic air treaties, privatising the road network etc. Fortunately, for Justine, most of the non-existent troubles already have plenty of wrong remedies. Hence, we have CrossRail and HST2 and fare control. About the only good solution is the proposal to raise the motorway speed limit to 80mph. That is likely to be hugely popular even if (much to my annoyance) it comes from the EU. Get your paws all over that one, Justine. So, just from a political standpoint (putting prosperity, wealth generation and morality to one side for the time being) I see no reason why Justine Greening shouldn’t promise the earth. What has she got to lose? Most Londoners know what it is like to get on a train at peak hours. The carriage will be crowded. You’ll be so tightly packed that you won’t be able to read. You’re almost certain not to get a seat. And even if you do manage to get a seat you will find it too narrow and lacking in legroom. The reason for this is simple enough: plain ordinary supply and demand. Normally prices adjust so that supply and demand are in balance. But when fares are artificially held down by the government - as they are in London - supply falls and demand increases. In this case it means less space and more passengers and thus, overcrowding. Isn’t all this just a case for state ownership? We tried that. It was called British Rail and there was plenty of overcrowding there too. Why was overcrowding so bad on British Rail? Because politicians liked keeping fares down but disliked shelling out for new rolling stock. But if fares were free wouldn’t the train companies put them up sky high? It is worth remembering that in the days when fares were freer (before nationalisation) although people grumbled (particularly about freight rates - but that’s another story) it wasn’t that big an issue. Isn’t it pretty obvious what people want? What they want is a seat. Is that true? Sure they want a seat but how much do they want it? Let’s face it on many lines in London you can get a seat if you are prepared to pay the First Class fare. But how many people are prepared to do that? The truth is that people are prepared to forgo the comfort if it means saving some money. For what it’s worth, my guess is that given enough freedom and enough time things will work out for the better for just about everybody. Some companies will change their working hours for some staff encouraging them to travel outside the peak. Train companies will have a variety of classes ranging from luxury to standing-only depending on what people are prepared to pay. And standing will be nicer. One of the worst aspects of standing in London is that you can never stand up straight. You’re always standing at a slightly contorted angle. Usually because you are bang next to a seat. But I think you would also find that train companies would invest heavily on routes people wanted to use. They would lengthen trains and platforms and improve headways and remove bottlenecks. Snopes has a video of their quirky pre-takeoff announcement. Novel at first, but possibly annoying if you fly with them all the time. I do like the liveries, though. The side of a plane is an interesting canvas, it’s nice to see some imagination used to paint it. The LA times has a nice picture gallery comparing the ways different airlines have used the space on their A380s. Enclosed suites afford passengers in first class a high degree of privacy. The suites feature sliding doors, a personal mini-bar, wardrobe and a 23-inch wide viewing monitor. The seats recline to form a fully flat bed. A divider that separates adjoining suites can be lowered for passengers traveling together. Like business passengers, first-class fliers have access to an exclusive lounge. In recent weeks and months I have been exploring the area around the big old East London docks, beyond the Docklands Towers, the ones that feature in the opening credits of Eastenders, and the ones which have London City Airport in the middle of them. Here is the relevant bit of google maps. Zoom in a couple of times in the middle of that, and you will see the area I’m talking about. You will see it even better if you click on “satellite”, which I have only recently learned to do. Do that and you can see actual railway lines and actual airplanes. My most recent wanderings around there saw me trying to find a path beside the river, starting at the north end of the Woolwich Ferry, going west. I didn’t get very far. I soon came upon industrial estates and jetties sticking out, places where actual work was being done, and actual transport, on the river. (A surprising amount of freight still seems to move up and down the river these days, in among all the more eye catching and frequent pleasure boats.) In the industrial estates pedestrians are not encouraged, although I did venture into one of them, until I got to a wall and had to turn around and go back. As for the jetties, random pedestrians can’t get anywhere near the river near them. Basically the Thames footpath stops. On an earlier expedition, I had started at the same point, north end of Woolwich Ferry, and travelled East. For a while, fine, there was a rather nice park right next to the river. But then it again stopped. There does seem to be an aspiration to have a continuous Thames Path in that part of London, on the north of the river as well as the south (which already has such a path), just as there is everywhere else. But it is taking a very long to time to join up in that particular part of London. At present the path there exists only in rather forlorn and run-down little fragments. So, anyway, on this most recent trip going west along the river, frustrated by industry, I turned right, northwards, back towards the docks and the airplanes. And I bumped into Crossrail. Basically, there are two branches of the Docklands Light Railway, one going north of the docks, and one to the south of them and then under the river to the Woolwich Arsenal. Plus, there is also a defunct regular railway line, that starts off on the north side of the docks, but then goes under them, and then goes along the middle of a long straight boulevard called variously (depending which side of the boulevard you are on), Connaught Road, Factory Road and Albert Road, between the docks and the river, just south of the southern branch of the DLR, and then it too disappears into a defunct tunnel that goes under the river to the south. However this defunct railway and its defunct tunnel will soon both be funct again, because Crossrail will be making use of it. At present, the line is a charming rural wilderness trail, fenced off, and dividing the Connaught Factory Albert boulevard down the middle. So make up your mind good and early which side of the Connaught Factory Albert bourlevard you need to be on. But although this means that although Crossrail will be going within a couple of hundred yards of the City Airport, which is right in among the docks to the north of where Crossrail will be, there are not now any plans for the trains to stop at this spot. It will stop at the top left of the docks, as it were, at a station called Customs House, nearly half a mile’s walk to the airport, and it will stop on the other side of the river, but, so far as I can work out from the www, not near to City Airport. There already is a Docklands Light Railway stop at City Airport, on the southern bit of it. However, the DLR is, for users of City Airport, very slow and frustrating. It takes an age to trundle its toy train way, stopping at every little stop on the way, from real London out to these docklands, which are beyond even the regular Docklands that people mean when they say that. I imagine most users of City Airport arrive by car, typically driven by someone else. The relationship between City Airport and Crossrail seems to have been quite acrimonious (sorry I read this on the www recently but I forget where). The impression I get is that Crossrail is perceived by City Airport almost as a bug rather than a feature, which seems a bit strange. It’s as if Crossrail is threatening to flood City Airport with Ryanair plebs, rather than the genteel taxi-delivered suits it now caters to. Or, maybe all this Crossrail activity is driving up local land prices and threatening to complicate various expansion plans that City Airport has. City Airport is certainly very busy. Airplanes land or take off there pretty much continuously. So I guess they figure that getting yet more people to their airport is not their problem. Their problem is making their airport shift more people to and from the air. I have lots of photos of this part of London that I have taken on my various trips. I hope to post some of these at my personal blog in the nearish future, but promise nothing. If any such snaps do materialise, I will put a link to them here. I am a fair weather motorcyclist. I tend to tax my bike for 6 months of the year. For the other 6 months I have to declare SORN—statutory off road notification. This is onerous enough. And if we get some freakish good weather in November it takes considerable effort to get it taxed and then SORNed again. Since tax refunds are only given for whole months, if the good weather only lasts a week I lose. To add insult to injury, there is a new rule that you must have insurance unless your vehicle is declared SORN, even if you are not using it on the road. It so happens that my insurance expires tomorrow but I have no plans to use the bike for a few weeks. I don’t want to pay for insurance I don’t need, and if I do SORN the bike in the middle of the month I won’t get the full refund. Perhaps more importantly, I don’t have time to research insurance quotes and I don’t have time to visit the Post Office for SORNing and re-taxing. Politicians and bureaucrats do not consider the full costs of their interference in people’s lives. A friend recently journeyed to the Hebrides, for one of those team-bonding, business-building get-togethers. She had an interesting journey. 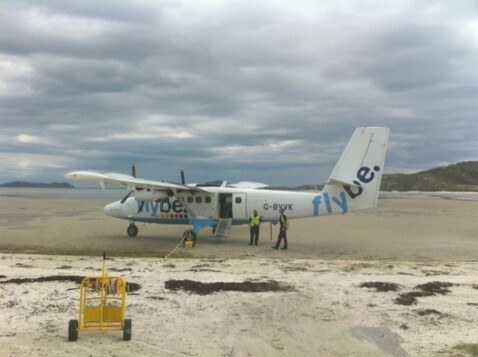 If, like me, you like small airports, you’ll love Barra. It’s a beach with a bungalow on it! Well, a bit more than a bungalow, but not a lot more. So, presumably you can only land when the tide’s out. It’s a British European de Havilland Canada DHC-6 Twin Otter, or so I presume. I like these obscure planes you’ve maybe not heard of, that do so much of the quiet donkey work in the world’s out-of-the-way places, of which, I surmise, there are a very great many. Here’s a video of the same (or an extremely similar) plane landing at Barra. It’s fun the first few times you see this. Ah the romance of propellers. It’s like there are still real steam trains everywhere, rather than just pretend ones for tourists and for weekend loonies to play with. On average, urban and intercity rail projects run over budget by 45 percent, roads by 20 percent, and bridges and tunnels by 34 percent. And the averages tell only part of the story. Rail projects are especially prone to cost underestimation. Seventy-five percent run at least 24 percent over projections, while 25 percent go over budget by at least 60 percent, Flyvbjerg finds. By comparison, 75 percent of roads exceed cost estimates by at least 5 percent, and 25 percent do so by at least 32 percent. Promoters of rail and toll-road projects also tend to substantially overstate future use, making those projects look more appealing to whoever is footing the bill. Rail projects attract only about half the expected passengers, on average, while in new research still in progress, Flyvbjerg finds that toll roads (including road bridges and tunnels) fall 20 percent short. This doesn’t bode well for Crossrail. I’m also wondering how the M6 toll road is working out. It seems like a fantastic road to me, but is it making enough money? That’s from a post by Penelope Trunk who has Asperger’s syndrome, about struggling with registering her car at the DMV, which is presumably one of those rituals people in the USA take for granted. We have similar rituals here in the UK, and I can relate to a lot of what’s in that post, particularly the above quote. This, on the other hand (see immediately below), looks like it might have its uses. When I was a kid I used to have a lot of fun throwing rulers through the air, while imparting a massive amount of under spin, like one of those hovering slices you do in ping pong, releasing the ruler sideways on. Hope that makes sense. The result was a whirring tube of physics activity that used almost to hover motionless. 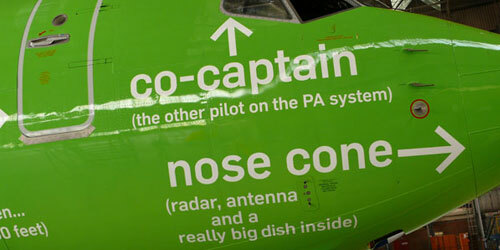 I’m guessing that the FanWing concept makes use of the same principle, and gets it seriously organised. The principle seems to be that, since an aircraft gets its lift from air passing fast over its wings, the more “wing” you can contrive to get air passing fast over, and the faster it can pass (even if the aircraft itself is moving very slowly, like my rulers), the more lift you get. On the other hand, they’ve been messing around with this thing for over a decade, and it still seems like little more than a toy. But then again, I presume it took them quite a while to get those other contraptions based on similar principles, helicopters, working usefully. When someone invents a totally new kind of transport, usually with not enough wheels, they tend to release a video which at least tries to suggest that, although actually mad, the new means of transport has glimmerings of sanity, and might have its uses for something other than sport, where the new mad machine merely competes against itself. But this video, of EDWARD the Electric Dicycle, seems to be going out of its way to prove that EDWARD the Electric Dicycle is completely insane, and has no uses whatever apart from turning its insane occupant upside down for no reason. I recently spent a week in Brittany (see various postings here, staying with friends who live in the city of Quimper, which at the south west end of the Brittany peninsula, just before you get to the final southern tip. I’ve stayed with these friends before, and on every trip before this latest one, I’ve flown Ryanair from Stansted to Brest, Brest being about an hour by car north of Quimper. But the bad news is that Brest airport has recently constructed a swanky new Norman Foster type building, with lots of sloping glass and metal struts everywhere and a general absence of rectangles. Somewhere in among all these new arrangements, there was a fight with Ryanair, the upshot of which was that Ryanair no long does flights from Stansted to Brest. Strangely, though, Ryanair still does flights from Brest to Marseilles. I’m guessing that this either has to do with money or with time, or perhaps a bit of both. Maybe Brest airport wants to be paid more, or Brest itself wants to pay less, for Ryanair flights to and from London. Or, the new airport arrangements mean that Ryanair can’t turn its planes around as quickly as it used to be able to. Also, you can’t help suspecting that perhaps Brest built itself a posh new airport terminal because it wants a better class of persons to come to Brest from London, and from many other classy spots, and the dribble of Ryanair riff-raff to stay away. Maybe some day soon there will again be flights Brest/London flights, but more expensive ones, containing richer and better dressed persons. But those are just guesses. Anyway, whatever may have caused the Brest/London Ryanair flights to end, for this latest visit I had to go from Stansted to Dinard, which is the airport of the port city of Saint Malo, which is at the other end of the Brittany peninsula, to its north west, about four hours drive from Quimper. Very tiresome. My hosts kindly collected me from there on the way. And on the way back, I and Mrs Host were both going to London, so we went by train from Quimper to Saint Malo (changing at Rennes), and then took a bus to Dinard and a taxi from Dinard to the airport itself. All very cumbersome. It did give us a chance to wander about in Saint Malo, which was good, and I got to go by train in France, which I’ve not done for decades, unless you count Eurotunnel trips to Belgium, Germany, etc. While we relaxed in the small bar at Dinard airport, Mrs Host and I agreed about how agreeable these small airports are, compared to huge designer cattle shed airports like Stansted, and such as Brest seems now to want to be. 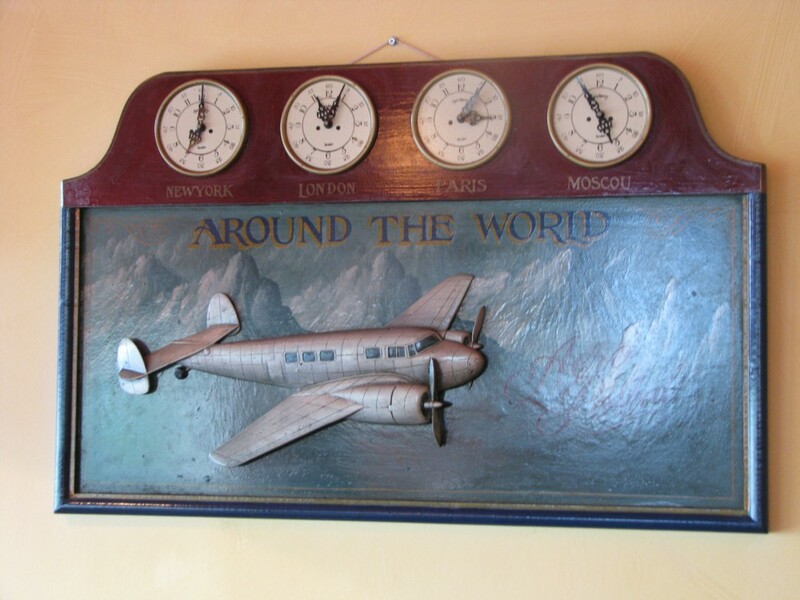 Mrs Host reminisced about a cheep and delightfully informal flight she once took from a tiny airfield in Kent, to a similar airport not very near to Paris, for about £45 in about 1990, in a propeller driven plane. Our preference was confirmed hideously when we got to Stansted, at about eleven o’clock at night, to find ourselves at the back of a vast hoard of incomers to London, waiting while too few people indolently looked at everyone’s passport. Were they seeking a terroristic pin? If so, we were the haystack. It was bank queue hell multiplied by a hundred. Actually, it was over rather sooner than it at first looked like it would be, but first impressions were deeply unpleasant, and are hard to forget. This experience makes me think that the long-term future of air travel is lots of small airports rather than a few big ones. The big ones can’t get any bigger, or nastier. And the bigger the big airport planes (I’m thinking A380) get, the naster it will get to use these airports. 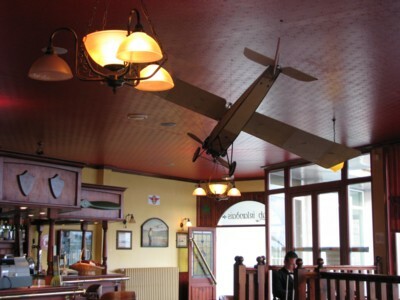 Dinard airport, meanwhile, was a delight. It’s not quite just the one shed. An architect was involved at some point in making the ugly boxy building where you congregate, but this feels more like a railway station than an airport, and what is more a railway station that is quite a bit smaller and more relaxed than, say, Rennes railway station. Dinard airport is small, and shows no sign of wanting to get any bigger. Boeing having bet their farm on the Dreamliner, a two engined go-anywhere improvement on the now ubiquitous Boeing 737 (which is what Ryanair now uses for most of its flights, including all my Brittany trips). Airbus have bet their farm on the A380, a four engine enlargement of the Boeing 747. 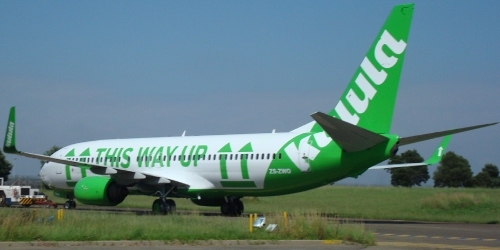 In the short run, maybe Airbus have a point. If the current question is: How can we get more cattle through the big cattle shed airports?, then the A380 may well be the answer. And if the question is: How can we give more legroom to more money-no-object globetrotters, trotting globally from one huge financial centre to another?, ditto. But what if, in the longer run, the question turns into: What’s the best way to get little clumps of people, inexpensively, from a small airport somewhere in the world but nowhere in particular (like Dinard or for that matter Quimper, which also has a small railway station type airport) to another small airport somewhere else in the world, for the tiny number of people who want that particular journey, yet who don’t want to be treated too much like a herd of cattle? Maybe if you run the air passenger business, and run airports, the first two questions are what you now obsess about. But speaking as a passenger, I can tell you that I greatly prefer the latter question. I want a Dreamliner world, rather than an A380 world. How would you like to line up at customs having just gotten off the back of the second or third A-380 to arrive? Would passport control take longer than the flight? Exactly. What I feared was going to happen at Stansted on the night I passed through this week, would happen, at a truly mega-airport like Heathrow, for real. I could ramble ever onwards, but instead I will say: over to Michael Jennings for more detailed answers to all of my questions, and for many more facts to back up or contradict my speculations. Prepare yourself for the full horror. Rail commuters were trapped on a train for up to six hours and then threatened with arrest when they tried to escape overheated carriages. Tens of thousands of people - including a woman who is eight months pregnant - were caught up in the chaos that left 60 trains stranded last night in the middle of Transport Secretary Philip Hammond’s Runnymede and Weybridge constituency. The crisis, caused by thieves who stole power cable, brought the line to a standstill at 6.30pm and left passengers trapped until after 11pm. Today commuters attacked rail company South West Trains as a “shambles”, as they described how they tried to escape from carriages only to be told they were breaking the law. The heavily pregnant woman, Emma Firth, 35, told how she and a group of passengers decided to “make a bid for freedom” at 10.30pm after being trapped on a train from Clapham Junction since 6.30pm. But as they tried to climb down on to the track, guards made an announcement saying they would be arrested for trespass if they did. A severe delay. Harassment of travellers, no doubt for what seemed like very good reasons (safety, basically) when the rules being followed so charmlessly that night were put in place. So far so routine. A train spokesman said a review of how it responded to train disruption has been ordered. “We are very sorry for the significant impact last night’s signal problems had on a large number of our passengers. “We would like to thank them for their patience during some extremely difficult circumstances. “We appreciate that many passengers spent several hours on trains while Network Railengineers worked hard to rectify the major signalling faults. Network Rail has confirmed today that the signalling problems were caused by an attempted cable theft. “We are extremely angry and frustrated that mindless and irresponsible vandalism meant that many of our passengers had a terrible journey last night. “Our station, train and customer service teams did their very best to keep passengers updated at the main locations across our network and to help get customers home through the night. My blog posting title has already given my game away, but honestly, had I not done this, would you have spotted what I spotted? “Passengers”. For years railway people in Britain have been calling us “customers”, a usage that I do not like for reasons I find tricky to explain even to myself. It’s something to do with the fact that the word “passenger” describes the true relationship. We are at their mercy. When they called us “passengers” they were acknowledging this fact. Calling us “customers” attributes to us a spurious degree of autonomy, like we could get out at any moment if we didn’t like the journey. Which (see above) everyone knows we actually can’t do. And if we got off at an earlier station because we didn’t like the journey we were being subjected to, we’d not be given our money back. Besides which, once you’ve committed to a train journey, the only logical course is to stick with it. If you don’t like it, you don’t do it again. But while it lasts, you must simply endure. I see what they’ve been trying to do with all this “customer” talk. They want all concerned to realise that market disciplines are in play, especially their own staff. The last thing they want is for their staff to act, in a bad way, on the idea that we are totally at their mercy. Trouble is: we are. This is a fact which all concerned ought to be facing, not dodging, even verbally. I have similar feelings about the word “patient” as used by health services. If a hospital started describing its charges as “customers”, I think I’d feel that the same kind of verbal dishonesty, the same kind of falsehood about the real relationship involved, was being perpetrated. My guess is that this reversion to the old word was a mistake, made in stressful conditions, rather than any kind of major policy shift. But even so, interesting, I think. Once upon a time the trains were so punctual you could solve murders just by looking at the timetables. H/T Brian who related this sketch to fellow transport bloggers this evening over a beer. Today I received an IEA email newsletter, which drew my attention to a (fairly) recent (May 24th) blog posting by Richard Wellings at the IEA blog, calculated to confirm all our prejudices here about privatisation (good) and government regulation (bad). The recent history of Britain’s railways has undoubtedly brought the whole concept of privatisation into disrepute. But this is unfair. Rail privatisation was a pastiche of genuine privatisation - in many ways it actually increased the level of state control. A truly private railway would be efficient, innovative, responsive to consumer preferences and would not require taxpayer support. It is time the critics (such as Will Hutton) stopped blaming privatisation for problems caused by government intervention. The guts of Wellings’ argument is that in a truly free market, railway companies would have been free to integrate vertically, and being free to integrate vertically, they would have. The irrational separation of ownership between track and trains would have ended. The government did not allow this. Maybe the new government will? I photoed this yesterday afternoon, embedded in the pavement in the top bit of Horseferry Road, just past the Channel 4 building as I walked towards St James Park tube. I was baffled, and despite visiting the website alluded to, I still am baffled. 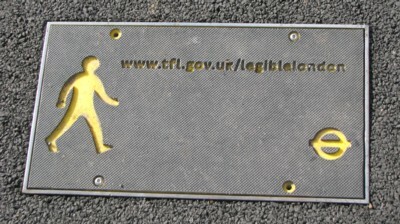 It says: What is Legible London? Those were my exact sentiments, and they remain my sentiments. It is something to do with the fact that walking is often quicker, for short journeys, than using the underground. But why this plaque in the pavement? Is there some kind of electronic gizmo underneath, with feeds into iPhones or something? I am sure there is a semi-rational explanation, but can anyone oblige? It is necessary to compare the total costs and the total yields of both systems. The fact that the electromobile needs no gasoline is no proof that it is cheaper to run than the gasoline-powered car. Socialism, Ludwig von Mises p161 (in my edition). First published in 1922. Here is a comic strip about a handy device to make driving more pleasant. I am currently watching the second series of Yes, Minister on DVD. This is a scene from the episode, Doing the Honours. Bernard: A few minutes. This M40 is a very good road. Hacker: Hm. So’s the M4. I wonder why we’ve got two really good roads to Oxford before we got any to Southampton or Dover or Lowestoft or any of the ports. Bernard: Well nearly all our permanent secretaries went to Oxford, Minister. And most Oxford colleges give very good dinners. Hacker: And the cabinet let them get away with it? Bernard: Certainly not, they put their foot down. They said no motorway to take civil servants to dinners in Oxford unless there was a motorway to take cabinet ministers hunting in the shires. That’s why when the M1 was built in the ‘50s it stopped in the middle of Leicestershire. Hacker: Oh, come on Bernard! Well what about the M11? That’s only just been completed. Don’t Cambridge colleges give as good dinners as Oxford? Bernard: Oh yes of course, Minister, but it’s years and years since the Department of Transport have had a permanent secretary from Cambridge. I wonder how much truth there is in it. The government seems to be keen on changing the rules of the road. Police will get powers to fine careless drivers on the spot, rather than taking them to court, as part of a government strategy to make Britain’s roads safer. Ministers say motorists who tail-gate, undertake or cut others up often go unpunished and that introducing instant penalties would be more efficient. Offenders would get a fine of at least £80 and three points on their licence. The trouble with on-the-spot fines is that they are easy for the police to hand out, and your average law abiding citizen will just pay up, rather than risk the cost of a court case. Of course, “the proposals will have to go through Parliament”, but these things have a certain inevitability about them. There are also plans to mess about with speed limits. The Lib Dems are against the proposal to increase the motorway speed limit because of global warming. I’m not happy about the proposal to reduce rural speed limits because driving fast on rural roads is fun. I quite like the notion of “Top Gear politics”, though: it sounds like an improvement on normal politics and green groups are against it. I took this photo in the port city of Algeciras in Spain last Thursday. I was looking for a nice contrast of things, and I thought that the bullring in the foreground, an in some ways fairly typical spanish city in the middle, and a long line of cranes indicating that this is indeed one of Europe’s most important ports in the background was nice. 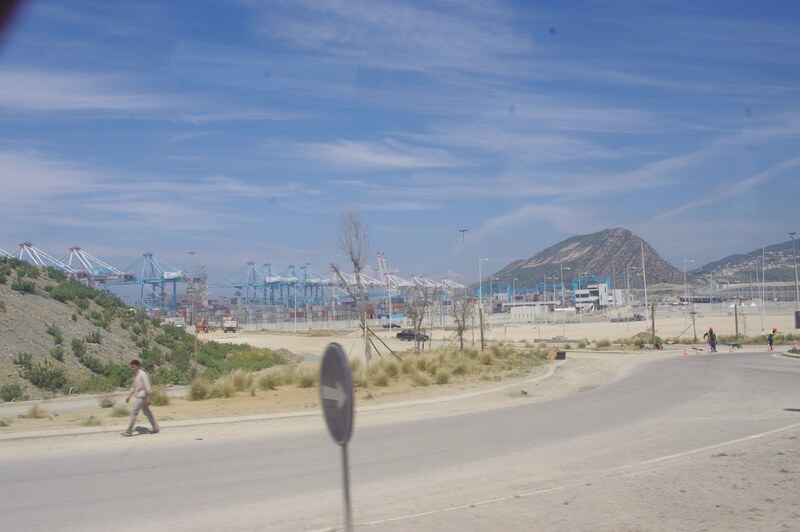 Algeciras, like Felixstowe, is one of those ports that is not historically very important but is a very major point now due to its strategic location. The really large ships on the route through the Mediterranean and Suez Canal to Asia are not going to divert to Valencia or Barcelona, so they stop at the very bottom of Spain. Containers can then be transferred to smaller ships to head north or elsewhere, or onto trucks or trains to be taken to other points in Spain. (When container shipping arrived in UK, another reason why much of the shipping moved from London to Felixstowe was that the Port of London was very heavily unionised and Felixtowe wasn’t. I am not sure if a similar factor came into play in Spain, given that the alternative of Cadiz is also famous for its labour disputes and militant union men. in any event, Algeciras is now the key port. With respect to the photo, having taken it I then realised that I also had the Rock of Gibraltar behind the port, and it is always delightful to get more in the photo that you intended. Of course, “hub” seaports (in which containers are unloaded from one ship to another, or possibly other modes of transport) are like hub airports. Location is important in the sense that they need to be very conveniently on the route from A to B, but local markets are possibly less important than the strategic location and efficiency of a port. The busiest container port in the world is in Singapore, which is a significant but not very large market in a perfect location at the end of the Straits of Malacca. (The two Chinese ports of Hong Kong and Shenzhen - essentially two parts of the same urban area with a border down the middle - are each individually close to Singapore in terms of size, however. Combined they are massively busier). Algeciras on the Straits of Gibraltar is a perfect place for such a port, but so is Tangier in Morocco. (The Indonesian island of Batam is as good a place as Singapore, too, but building a major port in Indonesia is just too hard). 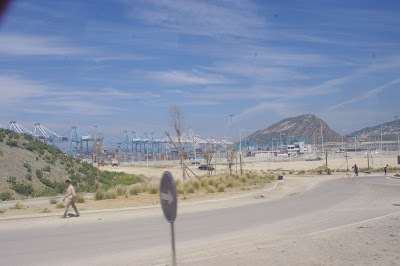 And as it happens, there is an enormous project to build a gigantic port in Africa, directly opposite Algeciras, the so called Tanger-Med, port, actually about 40km east of Tangier. I visited it the day before I visited Algeciras. It’s actually a lot bigger than that - I was only able to get a certain amount into the photo. 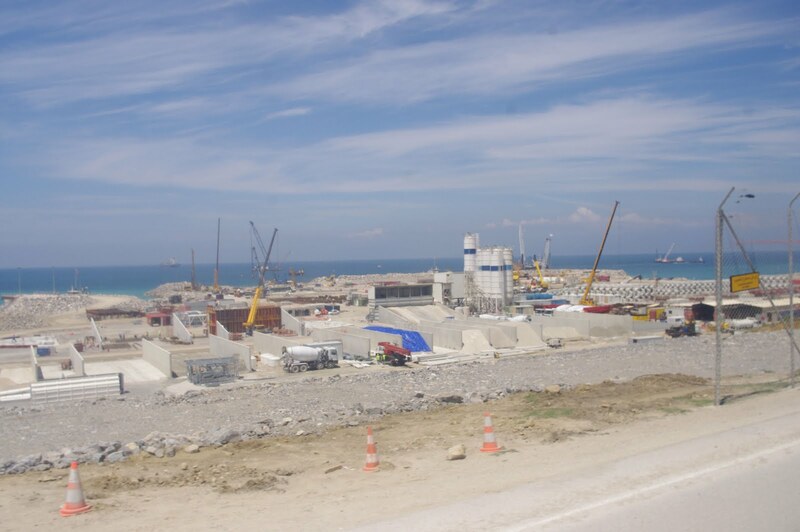 In fact, when complete, it will be much bigger than the port at Alegiras on the Spanish side. There is a lot more under construction, too. Plus there is an extensive motorway system heading south. When the port is complete, it will be the largest and hopefully busiest in Africa. To some extent it is to compete with Algeciras - in terms of transferring containers from one ship to another, Tanger-Med will be more modern and will have lower cost and (hopefully) more flexible labour. As well as that, the port is about trade between Africa and Spain, Europe, and further afield, and this is all good too. One hopes that this is actually a sensible project, and that it will aid African development and international trade in a significant way. This of course requires efficient management, relatively free markets, the rule or law, and reasonably low levels of corruption. The port is apparently being built with government money, and run by “a private company with public sector privileges”. That sounds like an invitation for trouble, but is probably no worse than the arrangements by which many ports are run. One does also wonder from who the Moroccan government has borrowed the money. There is a reservoir of cheap capital that is used to fund Arab infrastructure (and other) projects that is ultimately based on the huge oil wealth of the Emirate of Abu Dhabi. Like all mispriced capital, such money can be useful if you are trying to borrow money to finance and build a sensible business, but the mispricing also tends to encourage bubbles, rentseeking, excess, and an ultimate collapse under a mountain of debt. Given the strategic location of Tanger-Med, a sizeable port is sensible, but one hopes that massive overbuilding has not occurred. 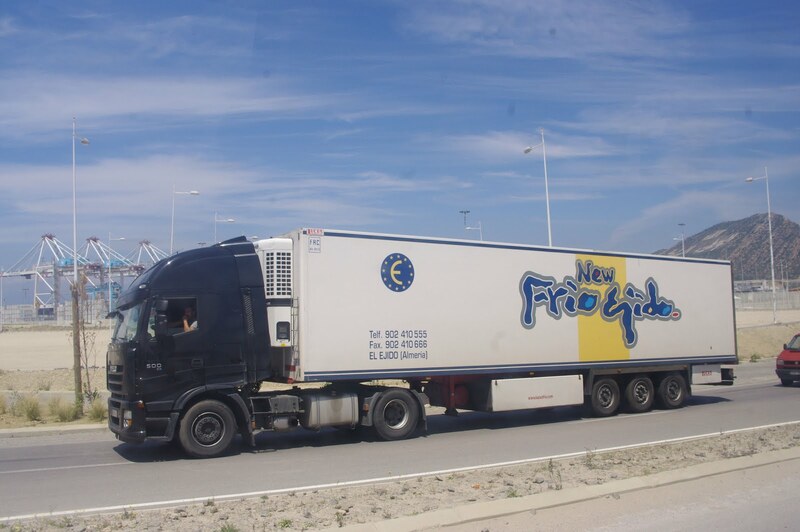 The story of EU aid for infrastructure projects in Spain and Portugal was starting off with sensible projects, and ending up with absurdity, and one hopes that this is not similar. As a Grumpy Old Man, I believe it is my duty to note some good things as and when they happen, if only to establish my bona fides when grumping about bad things. 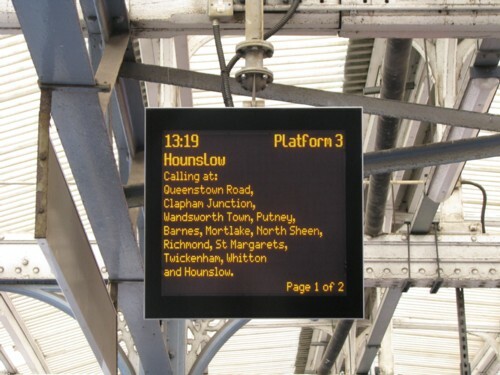 And one of the trends in human affairs of recent years that I have liked is the way that really quite informative electronic signs have multiplied in railway stations concerning the next bunch of trains, and if you are even luckier, at bus stops concerning the next bunch of buses. They could be better, mind you. 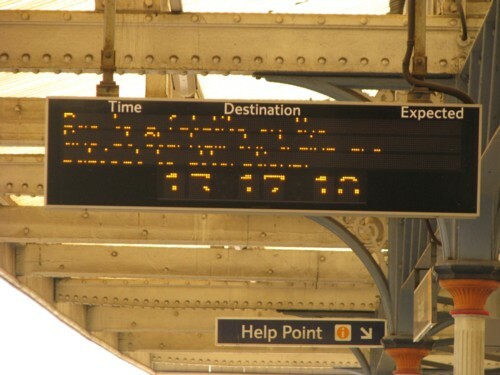 The railway signs typically tell you all the stations that the next train will be stopping at, but it doesn’t tell you anything about what stations the one after that will be stopping at, or the one after that. They only tell you the final destination. Not knowing whether the 13.36 will stop where you want it to might seriously affect how you feel about the 13.25. Yet, as it is, you have to wait until the 13.25 has come and gone before you learn for sure where the 13.36 will be stopping, at which point you could already have placed a bad bet, by not getting on board the 13.25. So, these signs are not perfect. But anything is better than ploughing through an idiotic Dead Sea Scroll timetable, which tells you the entire contents of some gink’s head last October, concerning all the railway trains that he believes will be in motion in the south of England, this entire May. Talk about a needle of information in a haystack of too much information. Another imperfection of these signs, from my point of view, is that they can often be impossible to photograph. That was actually quite informative, yesterday, when I looked at it for real. It told me, while I was waiting at Vauxhall on the way to visit my brother, that there had been a fatality on the line at Clapham Junction, and that I and all my fellow travellers should expect delays and rearrangements. And no, since you ask, it was not moving. Or, it didn’t look to the human eye as if it was. Only when I looked at my camera screen did it start jumping about manically. An unusual fatality sign is just the kind of titbit that you want on a blog, is it not? But, all my photo can do is illustrate a rumination about the weirdness of how digital photography sometimes interacts with reality. Sometimes, such weirdness can be entertaining, but here only a frustration. Although, interestingly, you can tell from the above photoat exactly what time it was taken. Under what circumstances might the photographability of an electronic sign be of significance to someone other than a mere blogger? Here. Reading the whole thing is much recommended. This month, I rode the bullet train from Beijing to Tianjin in half an hour - then returned by bus, which took two hours. Next to me on the decrepit, but packed, vehicle was a 17-year-old girl migrating to Beijing to search for work. She had never heard of the high-speed train, but when informed it cost $9, as opposed to $5.40 for the bus, expressed no regret at missing it. The bus driver assured me the girl was typical of his working-class clientele; to them, even a little money is more valuable than a lot of time. Small wonder that the Beijing-Tianjin line, built at a cost of $46 million per mile, is losing more than $100 million per year. A mobile version of all those overpriced apartments and shopping malls, in other words. The state of the world is now such that, if you want to be optimistic about your own country, don’t whatever you do look at your own country. Look at all the others. I’m watching F1 and as usual wondering how you could make it better. One of the things that bugs me is that it is not clear what question the sport is trying to answer. In most sports it is clear. In the 100 metres it’s the fastest sprinter. In football the best football team. But in F1 it’s never clear whether it’s the car or the driver. What if, I wonder, manufacturers were obliged to sell their vehicles for a fixed sum (say, £1m) at the end of each race? That way any team/driver who thought they were fastest would not be denied the opportunity to prove it simply because they didn’t have the right car. The other good thing about this is that it would encourage manufacturers to keep costs down. If you build a car for £10m and have to sell it for £1m you’re going to go out of business pretty quickly. And if costs are kept down that will reward the best engineers. I suppose there might be a problem with manufacturers not telling the new owners everything in order to preserve cosy relationships with favoured teams. Is F1 a legitimate topic for Transport Blog? I think we can just about get away with it.